There are a lot of images on this page. Please make sure to let them all load. 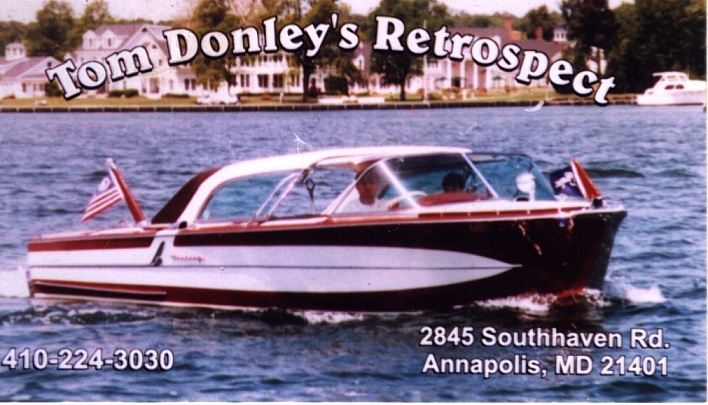 "The 23rd Annual Antique & Classic Boat Festival/The Arts at Navy Point"
"The Antique & Classic Boat Festival Vendors for 2010"
Tom Donley has many friends in the boating community and is widely respected by Century afficionados for his expertise and for his restoration of the '58 Coronado "RETROSPECT". It has taken many, many awards. I am very proud that Tom asked me to make the model of his boat. The commission started in the summer of 1998. It turns out to be a very complex boat. 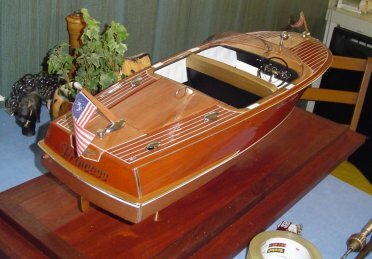 Starting in the 40's, but more so in the 50's, pleasure boat designers began utilizing vinyl and large decorative assemblies in ways that were more akin to automobiles than the boats that preceded them. The Century Coronado was designed with very lavish appointments that may not be obvious on first glance. The interior featured multi-colored vinyl trim, padded dashboard with full modern instrumentation, Lincoln Continental steering wheel, tinted glass, and two-tone seating. The deck featured planking aft, but the foredeck was raised and covered in padded vinyl. Around the foredeck, is venting for the forward part of the boat. The bow is protected by a heavy chrome nose-cone/bow-light/flagstaff assembly, the anchor light/flagstaff/gas cap assembly balancing the look with equally heavy, but futuristic lines. 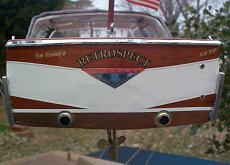 Gracing the transom is a "v" shaped chrome applique that has a grille, providing venting for the gas tank area. 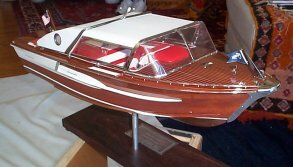 The lower sides of the transom are flanked by large chrome fins. 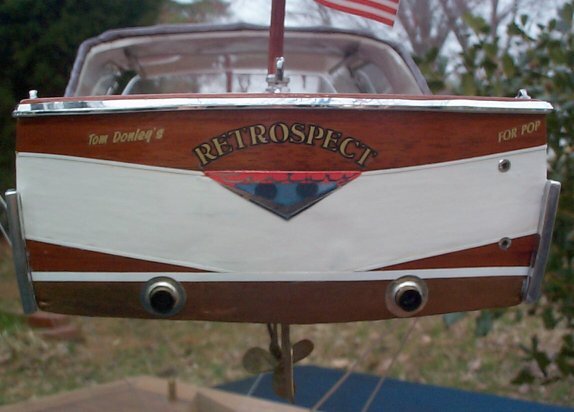 On the sides of the hull are horse head insignias, also made of chrome. To me, the most striking feature of the '58 Coronado (really all Coronados), is the roof assembly. 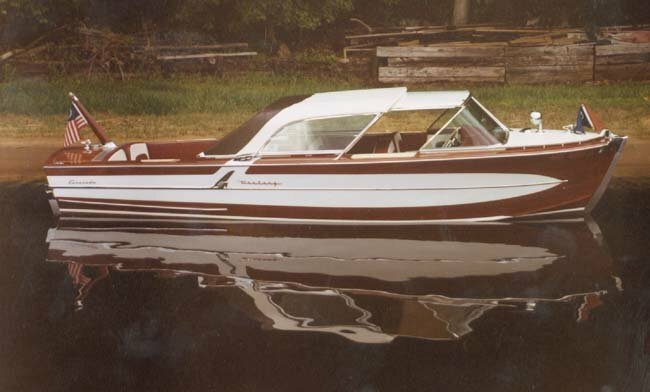 The roof is two-tone brown and white vinyl, again with chrome appointments everywhere, but hidden inside is a milk-glass retractable cover that protects the driver and front seat passenger from sun or rain. Let me stop here about the features, which go on and on... I will make two points: 1. 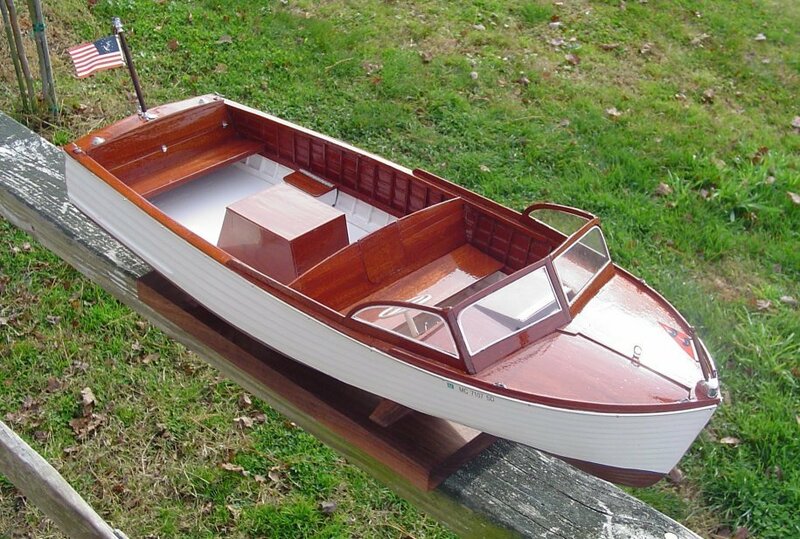 I had to get to know the boat quite well to design and build the model of it and 2. The design of this boat, whether you like it aesthetically or not, is pretty amazing. In the spring of 2000, John Wright of Lake Tahoe, California contacted me about making a model of his 1959 Century Coronado, knowing that I had made one of the "Retrospect". 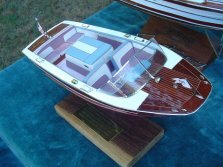 In order to get the best information to work from, it was arranged that we would to fly to the "Concours d'Elegance", at Lake Tahoe, where we could take photos and measurements directly from the boat. The plan was to try to finish the model within the year and deliver it at the 2001 "Concours d'Elegance". 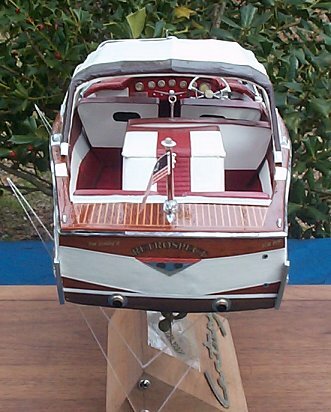 The '59 Coronado retained some common features from the '58. 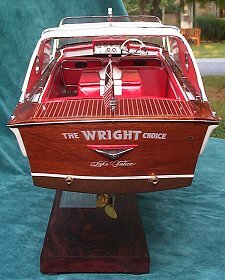 The seating arrangement and engine box location are similar. It still has the Lincoln steering wheel. 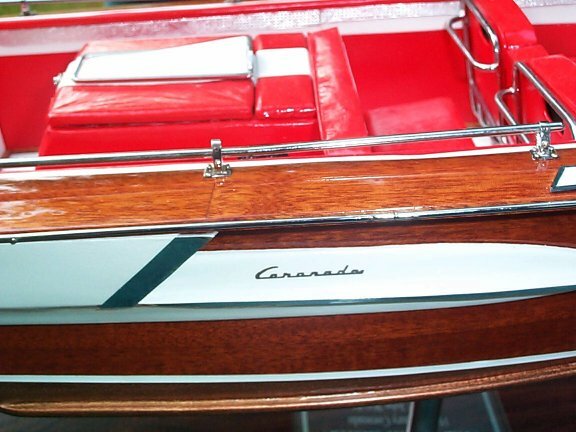 The basic Coronado theme is carried out with a vinyl roof, colors of white, reds, chrome and mahogany, etc. There are some major changes as well. Starting at the bow, the '59 has a vented nose-cone. The flagstaff on the foredeck is a wing made of chrome. The old curved windshield is replaced by a bubble (compound curve) version. 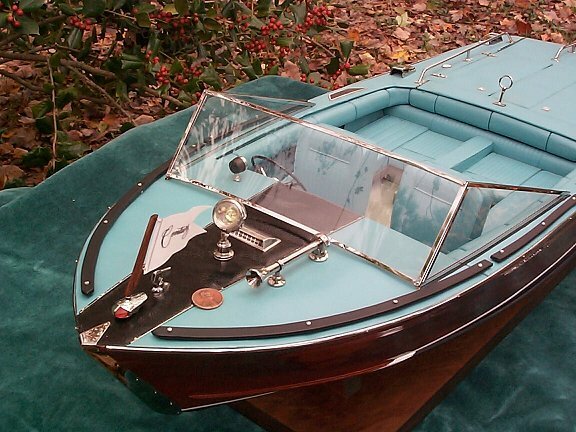 Instead of a milk-glass retracting insert in the windshield, the entire roof slides back and forth. This mechanism is probably the reason for the most dramatic differences. 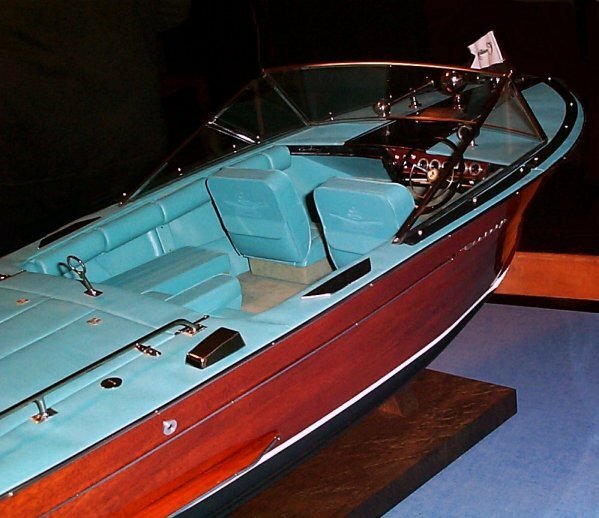 While the hull is tapered towards the stern, is in most boats, the sliding roof arrangement requires two rails which ride in rollers and they must be parallel or the mechanism will bind. This requires that the coverboards, the outermost deck planks, do not taper along with the hull. 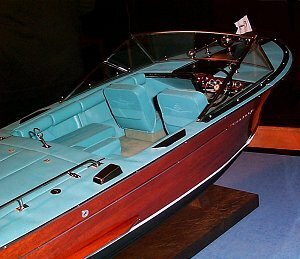 In order to support the coverboards so they would not break under weight, they had to be supported, which is done by fiberglass "appliques" running alongside the rear of the hull. 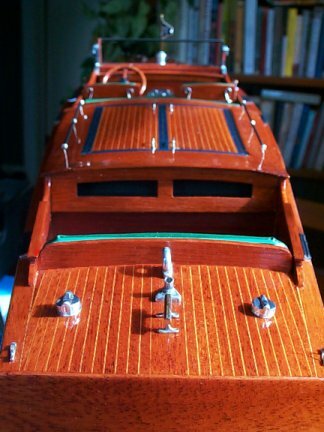 These appliques were given "jet-engine" intakes and lead to spray rails running about 3/4 along the length of the hull, parallel with the waterline. 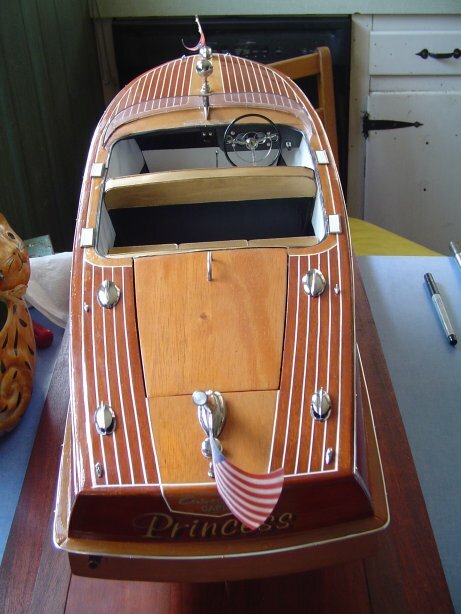 Other features included a chrome "crown" that runs across the roof and serves as a base for the anchor light, which was formerly on the rear flagstaff and opera windows. 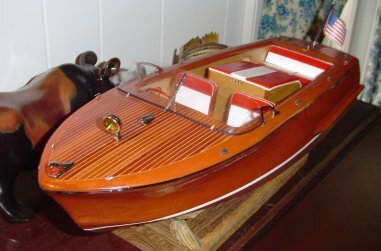 If you are familiar with '59 Coronados, you will note that the stock foredeck would be white vinyl, as on the "Retrospect" and that while "The Wright Choice" is virtually all mahogany, except for the white appliques, the stock model has white coverboards, transom and hull sides, except for an area of mahogany surrounding the applique. This model has a large amount of actual chrome. The roof slides on a miniature of the full sized system. The side windows also slide. 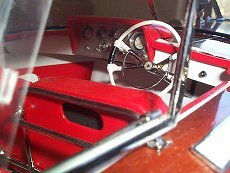 The steering wheel, has the gold starburst in the center as the original. 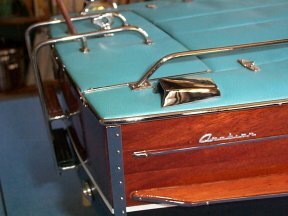 The front seat sits on tubular frame and although they can only be seen with a dental mirror, there are mahogany cubby holes underneath. I can't list all of the details here. 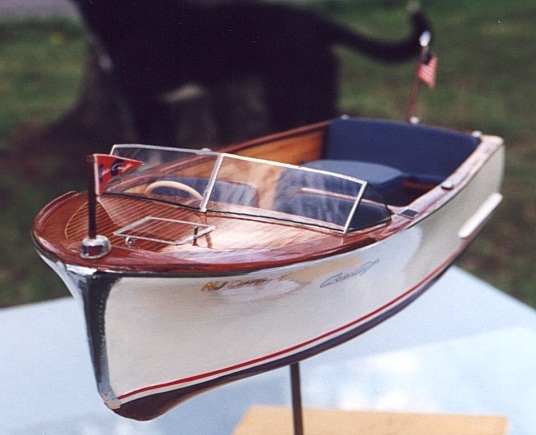 While I would have liked for more people to see this model, we finished it immediately before the Clayton, New York ACBS show, which was the weekend before the "Concours d'Elegance". I was very pleased with the compliments we received at both shows. Hopefully, I will hear from someone else with a Coronado. 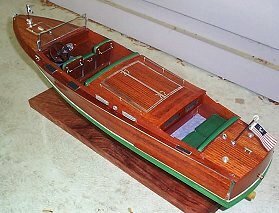 Model 21"; Scale 1":1'; Price upon request. It probably seems that all we make are Century's here. The fact of the matter is that we have done a few. 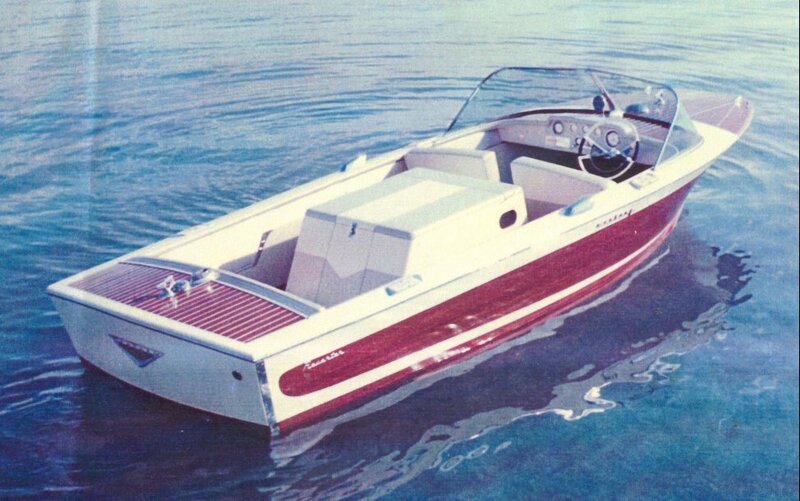 The Arabian for 1966 - 1968 represents an important design for Century in it was probably the best example of a boat that they built deliberately to enter the fiberglass market, which although sad on the one hand, was unavoidable by any major marine manufacturer that hoped to survive. 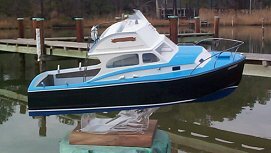 During this project we had the honor of speaking on a number of occasions with the designer of the boat, Robert Rioux, who was very informative and interesting. 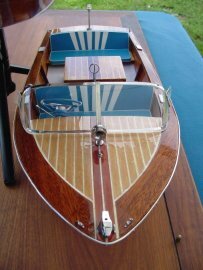 The method for introducing the glass hulls was very straightforward: Offer the same boat with the same specs in wood and fiberglass. 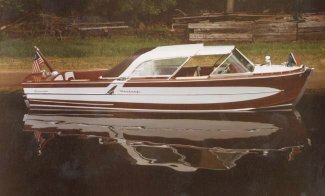 John Schimpke's boat is the former and you can see it is very sleek and a great marriage of classic and modern style for the latter '60s. 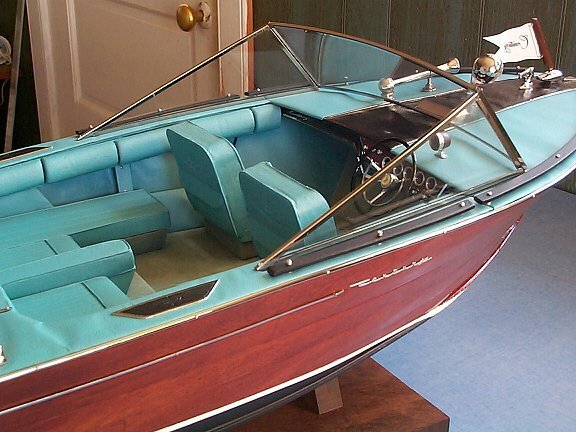 While it is common knowledge that the steering wheels of many boats of the era came from cars of the year before, we learned that some boats, including this one, had windshields converted from automotive rear windows of the previous year. 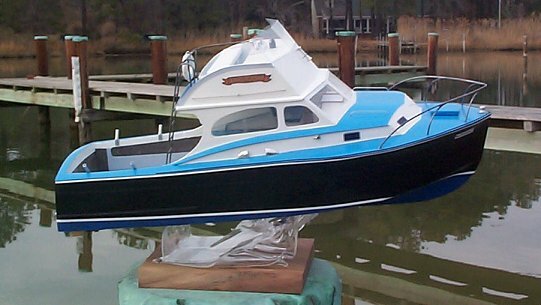 Unfortunately, I have not been able to reproduce the green/ blue/ metallic/ pearlescent finish in photos, but you can see it when you see the model live. We are back to another 1958 Century. 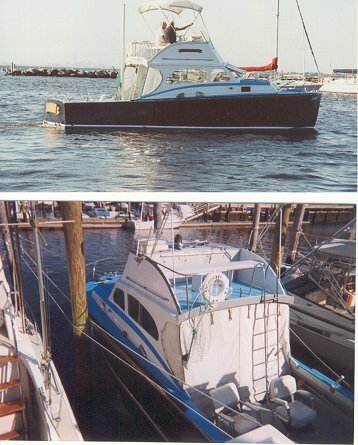 This time the 19' Resorter. Very well known for what has been referred to as its "aircraft carrier deck." Our research indicates that the interior colors were not stock. There was only one photo available of this boat and it is shown above. The very unfortunate inscription on the base says: "1958 Century Resorter 19'Destroyed in Beulah Boat Shop Fire 9:00 PM Sunday February 1, 1968". A sad end for a beautiful boat. 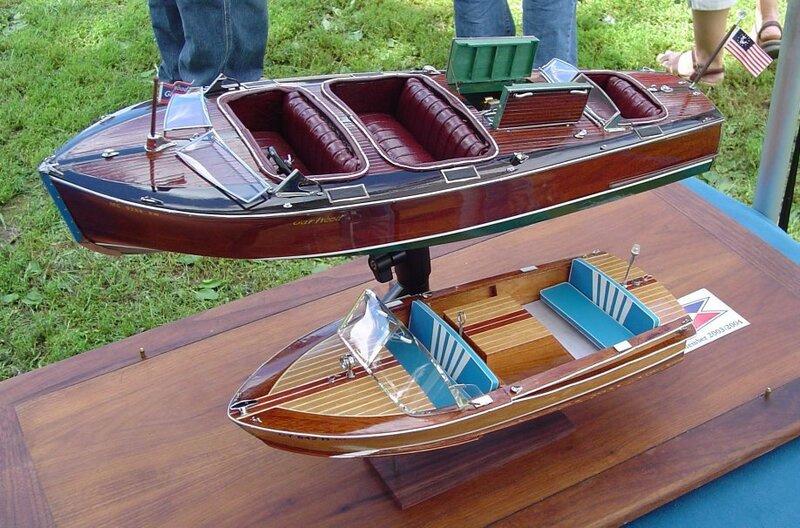 These are two models, the original is the "Mistie", which had belonged to my customer's family when it was new. Although he was unable to determine its later history, he showed me a copy of a film of its arrival and test runs from 1929. What a beautiful boat, not only in its styling, but in its performance. The customer sent a copy of that film to The Mariner's Museum in Newport News, Virginia, which is now part of their archives. As a result, it has been determined that the HIN# for "Mistie" was #945. 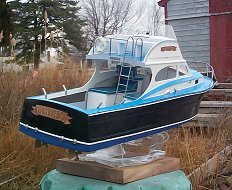 Because there is no cross-reference of these types of boats by hull number, it is not known whether or not this boat still exists. If anyone knows anything more about the story of #945, I would certainly like to know. I had planned to make a second copy of this model for myself. 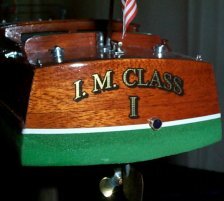 I was not able to keep it for long and this copy was sold and renamed "I.M. Class I.". You can see that while the two are similar, the stands are different. 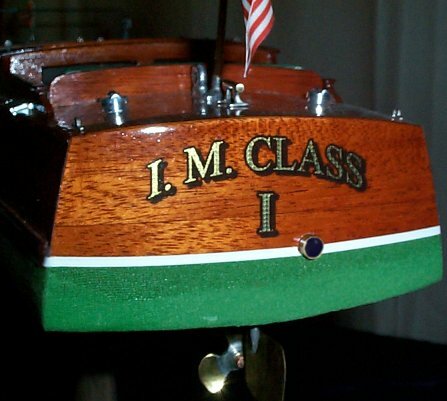 One of the interesting features about the "Mistie" is that the Chris~Craft company painted the name "Mistie" in the spot where they would normally place the Chris~Craft logo and there was not a name on the stern as we are accustomed to now. 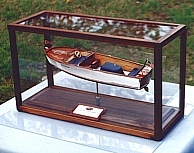 "Mary" represents an interesting detour for Chris-Craft. 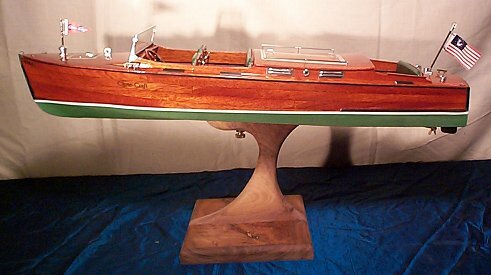 Because it was made at the end of WWII, mahogany was at a premium and white cedar was used to plank the sides of the hull. 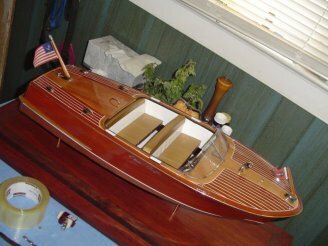 The resulting boat had a very harmonious appearance, balancing mahogany and chrome with white. 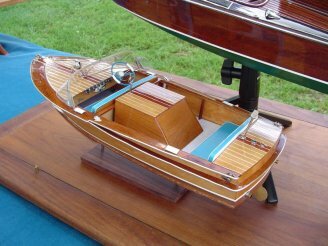 Sportsman models were also made all mahogany as well. 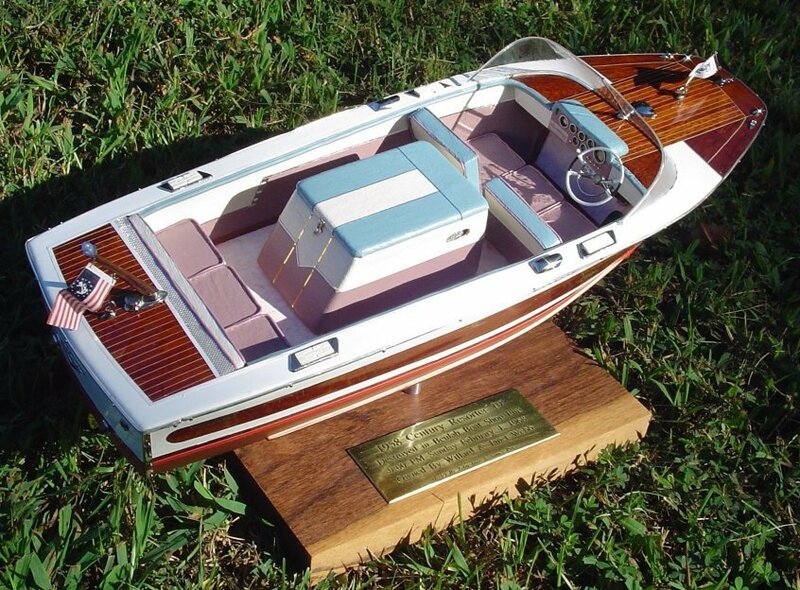 This boat won best of show at the Antique and Classic Boat Society's Show in St. Michaels, Maryland in June of 1998. 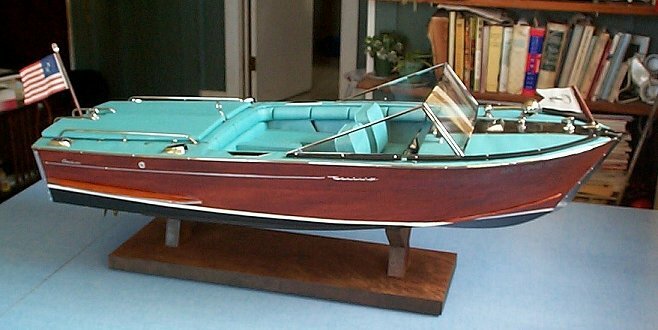 The upholstery in this model was made from the same vinyl used in the real "Mary". 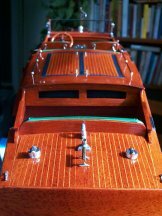 As with most of my mahoganys, each plank and seam are separate pieces of wood. It could be said that if there was a lapstrake version of the 22' Chris-Craft Sportsman, it would be the 22' Sea-Skiff. It is every bit as tough as our goat "Isabella" in the photo above. 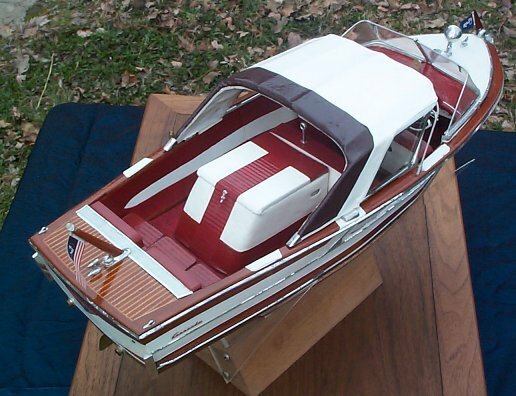 This one is also white and mahogany, giving it a balanced look. 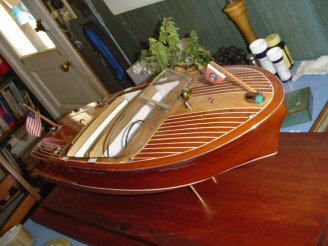 The lapstrake construction, along with its heavy skeg, can handle very rough waters and is very utilitarian, in addition to having a cuddy cabin. Sea-Skiffs were made in various sizes and configurations from small utility boats to large cabin cruisers. 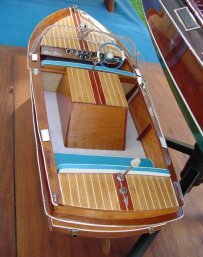 Roger Rollins' 1955 19' Chris-Craft Capri "Princess"
Among the features seen on runabouts of the 1950's were the signature "Bull-Nose" of Chris~Craft and the mixing of standard mahogany stains with blonde woods, achieved by bleaching. Among the significant classic models with these features were the Capris. 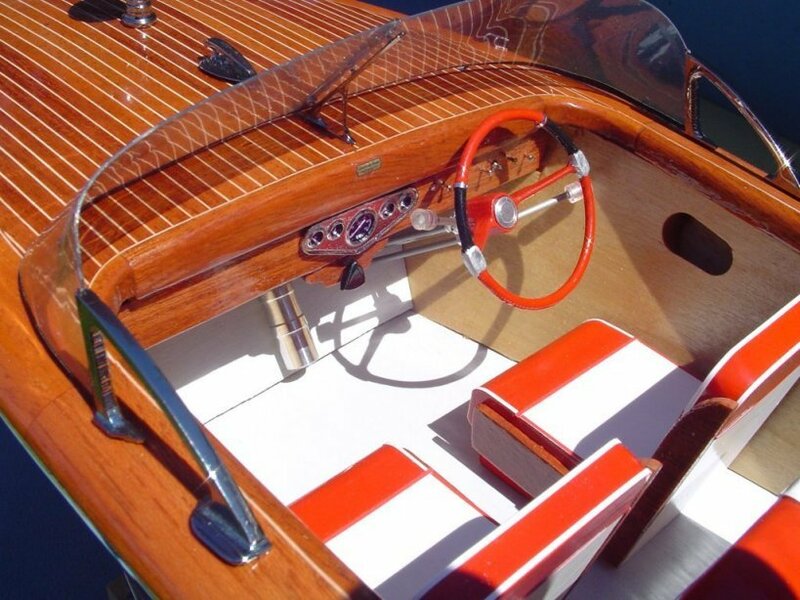 This one, made in 1955, shared features with the famous Chris~Craft Cobras including upholstery that was black alligator, metallic gold and white tile patterns. The windshield was also similar, being far more raked than that seen on other Capris. 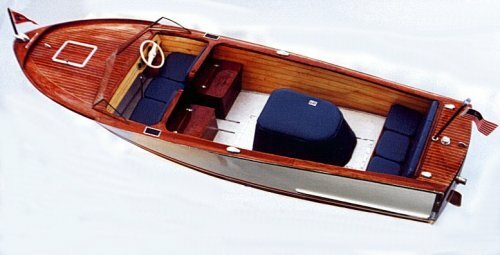 The Atom Skier is truly a cool boat. 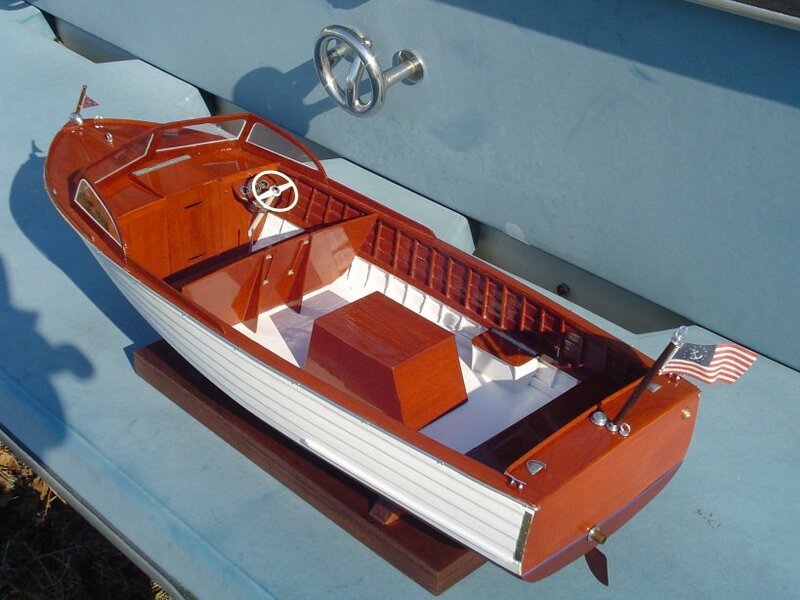 Made from marine plywood with much of its structural strength derived from the large rub-rail that surrounds the rear half of the boat, it is very stylish, lightweight and powerful. 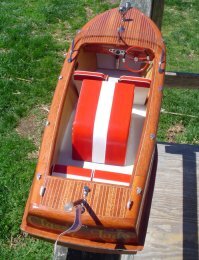 The upholstery had "sunbursts" and the caulked deck featured two-tone wood. There were "wings" on each side of the windshield. The larger boat in the lower picture is the "Triple-Time" a 1937 Garwood 25' Triple Cockpit Runabout. Ray and Linda Gilker's 1955 18' Shepherd Utility "Classy Lady"
Speaking of "cool", Shepherd made wonderful boats with aerodynamically curved sheerlines, brilliant colors, their own signature hardware and the use of clear acrylic for shift lever handles. 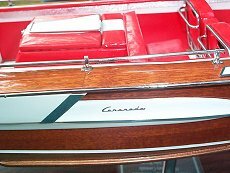 Like other Canadian manufacturers such as Greavette, their boats are built very sturdily and have high freeboards. As one of my Canadian friends explained to me:"The water can stay very cold year-round. You don't want to get wet!" 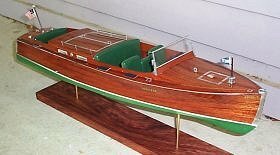 This model was tricky to design because it had to be done strictly from pictures, being a Christmas surprise for the owner. While the Prowler line did enjoy some popularity, there don't seem to be many left. I would love to hear from anyone who has more information about these noble boats. All Model Designs and Photograghs of models on this page are Copyright 1998 - 2007 by John Into. All rights reserved.